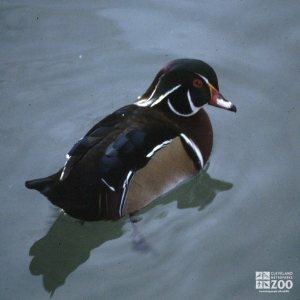 The range of the wood duck is from British Columbia to California, Nova Scotia to Minnesota to Florida and Texas and Cuba. The wood duck inhabits forest-edged lakes, ponds, swamps and marshes; and freshwater marshes in late summer and fall. Wood ducks are highly social only during migration and when wintering. At this time roosting sites can range from a few hundred to several thousand individuals. When they arrive at their breeding grounds, they are already paired and are found in groups of no more than a dozen birds. Nesting depends on available sites. They will nest in tree holes and will accept nest boxes. Raccoons and gray squirrels will destroy the eggs, and snapping turtles are a danger to the ducklings. When foraging on the water, wood ducks often tip up and can gather materials from water as deep as 18 inches. They rarely dive for food. The wood duck female is responsible for choosing the nest cavity, preferably high in a tree with an entrance too small for raccoons. Cavities over water are preferred. Only the female incubates, and the male leaves the female after the fourth week of incubation. When the ducklings are only 24 hours old, they will leap into space, often dropping 30 to 50 feet to the ground or water at their mother's call. The mother leaves the young at about 7 weeks.